TheÊfive tales in Flight are each a testament to the strength of the urge to fly in the years before 1903 when the Wright Brothers made sustained flight a reality. Each tale starts with a narrative of the attempt at flight followed by an image of the sky to which a paper airplane has been attached. 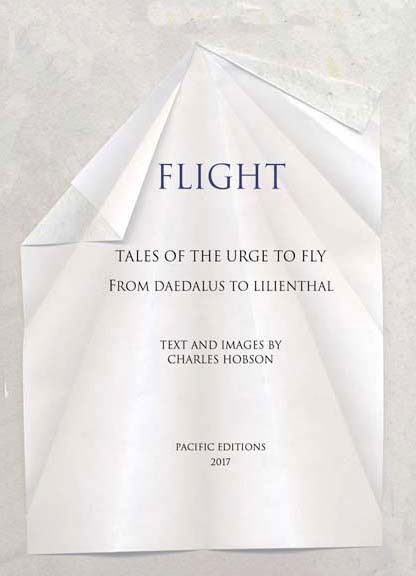 Above is the narrative about Daedalus and the paper airplane that contains a fictional message. 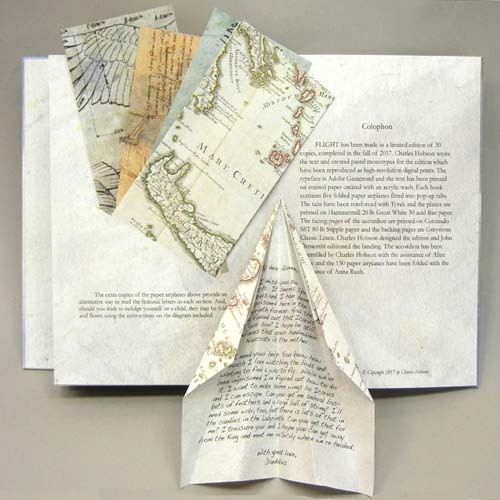 The airplane can be removed by the reader and unfolded to reveal a fictional message written to capture a personal incident in the life of the aspiring aviator.Ê Here the paper airplane has been made from a map of Crete and has been flown in the direction of the Queen. The fictional message written inside the folds of each paper airplane gives a down-to-earth view of each aviatorÕs real life setting. In each case the message answers a question posed at the end of the narrative that preceeds the folded plane. "Where did he get the feathers while imprisoned in the Labryrinth?" "Did he really fly in his machine?" "Who was the 10-year old who flew?" "What was his father like?" "Did he have good life insurance?" A second set of paper airplanes is contained in a pocket in the back of the book along with instructions about folding. These extra copies provide an alternative way to read the messages without unfolding the planes in the book. Each of the paper airplanes has a design on the back. For example, Daedalus made his plane from a map of Crete. Leonardo used one of his drawings of his flying machine. Flight is housed in a fabric covered drop-leaf box. 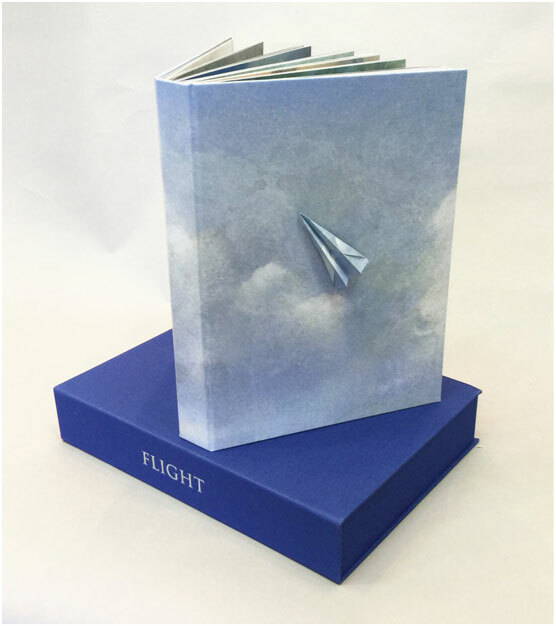 The book is covered with book cloth which has been printed with a cloud image that wraps around the front and the back. A small paper airplane made of the same cloud image has been attached to the cover. Aside for the title on the drop-leaf box there is no other text on the box or cover. THE BIRDS. On the reverse of the accordion are monotypes of the birds that the aviators watched and by which they were inspired.